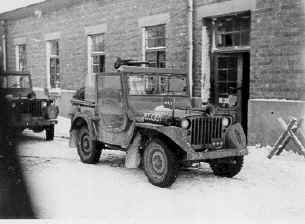 The Siege of Bastogne was an engagement between American and German forces at the Belgian town of Bastogne, as part of the larger Battle of the Bulge. The goal of the German offensive was the harbor at Antwerp. In order to reach it before the Allies could regroup and bring their superior air power to bear, German mechanized forces had to seize the roadways through eastern Belgium. Because all seven main roads in the Ardennes mountain range converged on the small town of Bastogne, control of its crossroads was vital to the German attack. The siege lasted from December 20 to December 27 when the besieged American forces were relieved by elements of General Patton's Third Army. After the successful Invasion of Normandy and the subsequent eastward push through France, the Allied front lines extended from Nijmegen in the north down to neutral Switzerland in the south. The valuable port city of Antwerp had been captured during the push, and by the time winter arrived, the Allies even had control of German territory near the city of Aachen. Hitler soon laid out a plan to attack the Allied lines in Belgium - 55 divisions would launch a surprise attack, with the aim of crossing the Meuse and recapturing Antwerp. Despite major misgivings from his senior commanders, including Gerd von Rundstedt and Walther Model, the plan was not modified and the jump-off date was eventually set as 16 December 1944. Meanwhile, the Allied commanders considered the Ardennes area to be unsuitable for a large-scale German attack, mainly because of terrain issues. 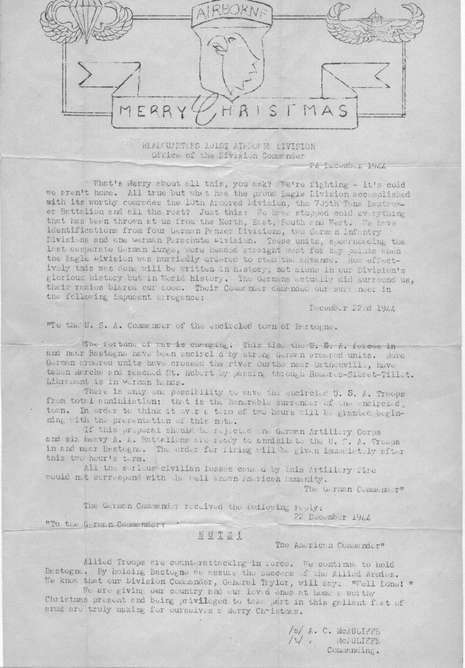 In addition, intelligence reports suggested that the only German divisions stationed in the area were weary, and in the weeks leading up to the assault, no Allied commander saw reason to believe that an attack was imminent. 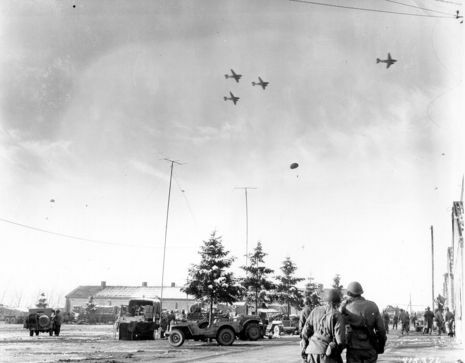 Bastogne, a hub city that commanded several important roads in the area, was defended mainly by the 28th Infantry Division, which had seen continuous fighting from 22 July to 19 November, before being assigned to this relatively quiet area. The Allies believed only an infantry division was present opposite the 28th Infantry, and they believed any attack along this sector would be limited in scale. Hasso von Manteuffel, commanding the Fifth Panzer Army, gave Heinrich Freiherr von Lüttwitz's XLVII Panzer Corps the responsibility of capturing Bastogne, before crossing the Meuse near Namur. von Lüttwitz planned to attack a 7-mile (11 km) front with three divisions: the 26th Volksgrenadier and the 2nd Panzer would lead the assault, with the Panzer Lehr Division behind them. Opposing this significant force were two battalions of the 110th Infantry Regiment (the third was held back as a division reserve), responsible for a nine-mile (14 km) front along the Our River. The Allied forces were gathered into small groups at major villages, with outposts along the river manned only during the daytime. Since the forces were too thin to maintain an even battle line, they focused their attention on the four roads that crossed the Our. Due to heavy rain preceding the German attack, only one of the roads was in good enough condition to be used as a crossing point - the northernmost road, which crossed the Our at Dasburg on its way to Clerf and Bastogne. The 2nd Panzer Division was assigned to cross the river along this road, while the 26th Volksgrenadier would construct a bridge near Gemünd for its crossing. von Lüttwitz realized the importance of the road network of Bastogne - he knew that the city had to be captured before his corps could venture too far westward. Therefore, he ordered the Panzer Lehr Division to push forward to Bastogne as soon as his other troops had crossed the Clerf River.